This rugged necklace is a distinctive Western Americana Style Hand-carved Buffalo Bone, Leather and Hair-pipe Bead Necklace. 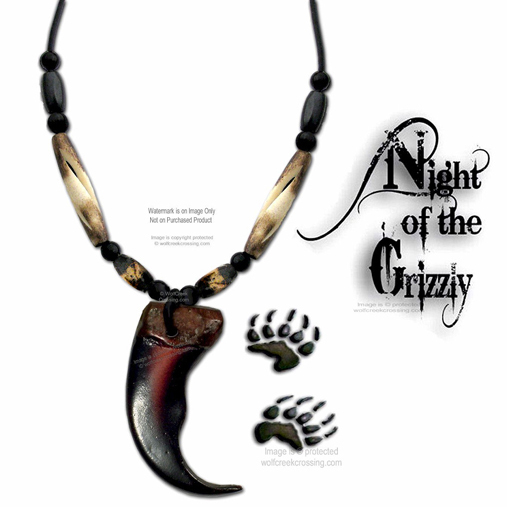 The Grizzly Claw is a synthetic, resin replica (not authentic) of a Grizzly Bear’s claw. It is illegal to buy or sell true actual bear products in most states. Why not have the next best thing? These replicas actually look as good if not better than authentic grizzly bear claws. 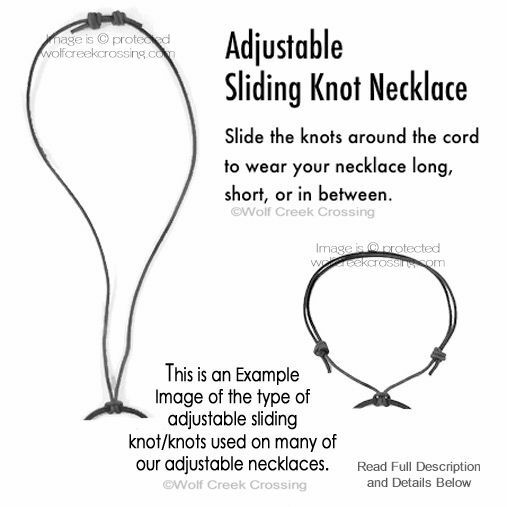 This necklace is an adjustable sliding knot necklace that measures twenty-four inch plus in length. Simply slide the knots around the cord to wear your necklace long, short or in-between! ALL of our products come to you in BRAND NEW, UNUSED CONDITION. We will package your purchase with SPECIAL care and send to you via USPS First Class mail. Grizzly Bear Claw Necklaces were worn by tribal men; both warriors and spiritual leaders sought to cultivate relationships with the powers of the bear. They were highly valued because they reflected the strength and courage of the bear. Bear claws were not considered to be mere symbols, but rather potent, compelling links to a living, spiritual essence of tremendous force. These necklaces are the perfect choice for reenactment events such as Mountain Man Rendezvous, Shaman Medicine Man, Pirate, Renaissance, Medieval, Pow Wow Rendezvous, Living History and many other events. 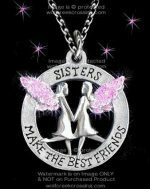 CLICK HERE for more of our Necklaces! CLICK HERE for more of our Grizzly Claw Items on eBay! The brown or grizzly bear (Ursus arctos) is one of the largest bears in the world, averaging 400-600 pounds for males and 250-350 pounds for females. Male bears can stand up to 8 feet tall. However, they vary in size from region to region depending on the richness of food sources. They live up to 35 years in the wild, and are excellent swimmers. Some have even been known to climb trees. Amazingly, they can run up to 30-40 mph. Their color varies from black to blond. During the western frontier days, the brown bear was dubbed the “grizzly” due to its frosted or “grizzled” coat. The grizzly bear is distinguished from the black bear by its humped shoulders, more upturned snouts and longer claws. Grizzly bears arrived in North America about 30-50,000 years ago. Until 100-300 years ago, the grizzly occupied most of the temperate, boreal and arctic regions of the West. Today, the largest populations of grizzlies remain in Alaska and Canada. In Eurasia, Russia supports by far the largest population of brown bears, although small populations hang on in Austria, Finland, France, Italy, Norway, Spain, Sweden, Syria, India, Japan and other countries. They are absent from the hottest and driest deserts – except for the Gobi in Asia. About 1,800 grizzlies remain in the lower-48 states, mainly in the Yellowstone and Glacier/Waterton ecosystems of Idaho, Montana, Wyoming, and adjacent lands in Alberta and British Columbia. In 1975 the grizzly bear was listed as threatened in the lower – 48 US states under the Endangered Species Act (ESA). Elsewhere in the world, small isolated populations are also considered to be endangered. Even in Alberta, Canada, grizzlies are considered to be threatened, raising questions about the future of adjacent US grizzly populations. For twenty out of forty years of ESA protections, the federal government and the states have been trying to remove ESA-mandated safeguards for grizzly bears—a process called “delisting.” Delisting is currently being actively pursued in the Glacier and Yellowstone ecosystems. A final rule to delist Yellowstone grizzlies was issued in July of 2017.